Earning a graduate degree, particularly when you must balance work, family, and school, is an outstanding accomplishment. 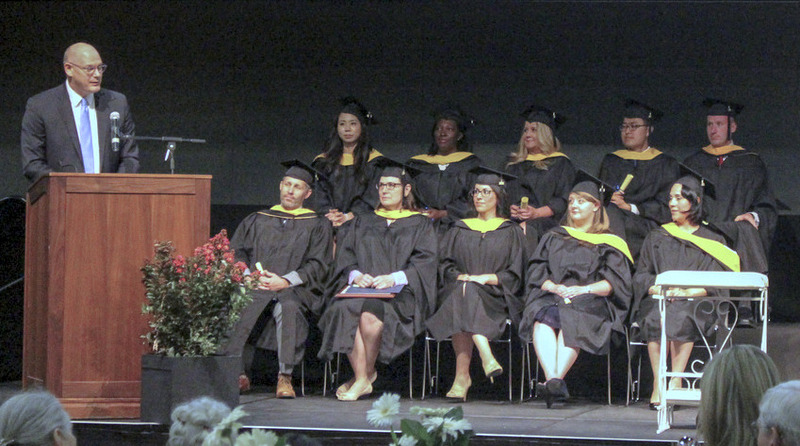 On June 18, 2016, we recognized the twelve deserving graduates from our Master of Science in Transportation Management (MSTM) program at MTI’s 24th Annual Awards Banquet and Convocation Ceremony. Keynote addresses were delivered by U.S. Secretary of Transportation (ret.) Norman Mineta and California State Transportation Agency Secretary Brian P. Kelly. We were inspired by their words describing the deep commitment it took for each of our graduates to earn their MSTM degree. Bernadette Lambert received the Valedictorian Achievement Award for her academic accomplishments while a student in the MSTM program. In her speech, she spoke eloquently about the many sources of opportunities available to the graduates, including how the new graduates are now in a position to provide opportunities for others. James Helmer (MSTM 2003) was recognized as MTI’s Alumnus of the Year for his significant contributions to the field of transportation and for his commitment to educating the mobility managers of the future. Jim is the past Director of the San Jose Department of Transportation and previously served the city of Santa Cruz as a Traffic Engineer. Jim remains active in the transportation sector and serves as an instructor in the MSTM program. An outstanding team from Morada Middle School in Stockton, CA, received the 2016 Garrett Morgan Sustainable Transportation Award and a check for $1,000. Present to receive the award for their Grape Stomp Bio-Fuel project were teacher Michael Hurst and students Tristan Bustillos-Hawk and Peter Lau. It is always a privilege to host this event where we celebrate our graduates’ achievements, recognize our outstanding alumni, and support future transportation professionals. California State Transportation Agency Secretary Brian P. Kelly addresses MSTM graduates. 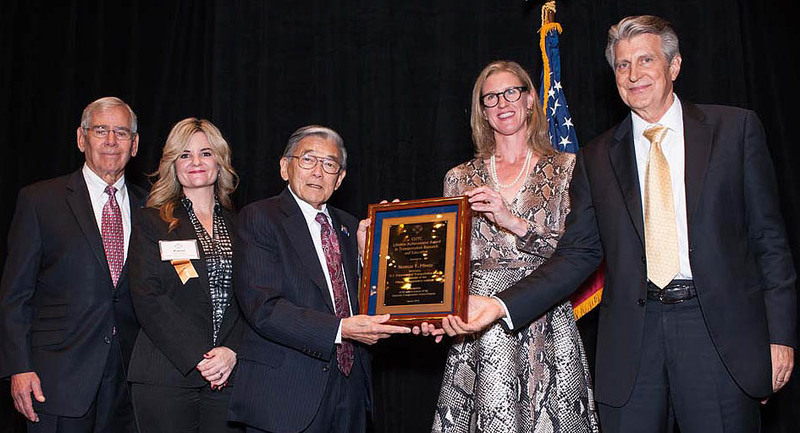 Norman Y. Mineta, MTI Founder, received the Lifetime Achievement Award from the Council of University Transportation Centers (CUTC) in January 2016 in recognition of his long and distinguished career and significant contributions in the areas of transportation security, transportation workforce development, and transportation education and research. 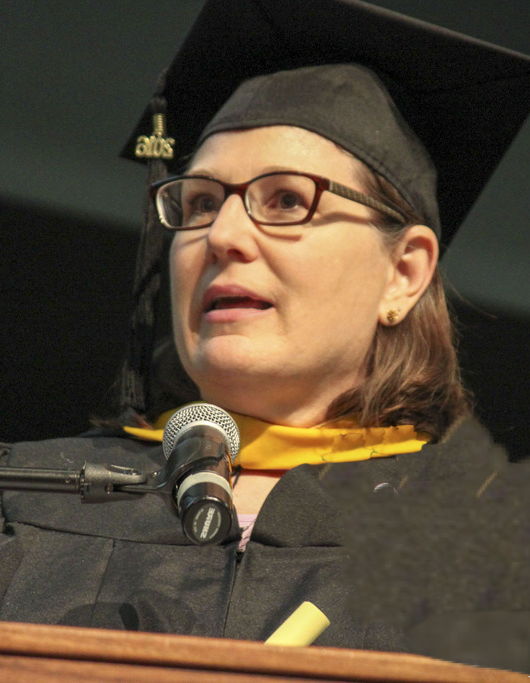 Frances Edwards, Ph.D., Deputy Director of MTI’s National Transportation Safety and Security Center, was honored by the College of Social Sciences at San José State University with the 2016 Austen D. Warburton Award of Merit in recognition of her high level of scholarly achievement. Karen Philbrick, Ph.D., MNTRC Executive Director was recognized by the Conference of Minority Transportation Officials (COMTO) as one of their “Women Who Move the Nation” award recipients in 2016. She was also appointed to the WTS Foundation Board of Directors in May and elected Secretary of the Council of University Transportation Centers in June. Charles Standridge, Ph.D., Professor and Associate Dean at Grand Valley State University, was recognized by the Office of Sustainability Practices at GVSU as a “2016 Sustainability Champion” through his leadership and research in the area of battery recycling. Harriet John, SJSU MSTM student and Valley Transportation Authority HR Analyst, received the American Public Transportation Association Dr. George M. Smerk Scholarship for outstanding achievement in public transit management. MNTRC congratulates these award winners, who exemplify the high standards and achievements of our entire team. Secretary of Transportation (ret.) Norman Y. Mineta receives CUTC Lifetime Achievement Award. With more than three decades of experience, Nuria Fernandez is a force to be reckoned with in the transportation industry. Her professional career has spanned a wide range of roles and responsibilities including planning, design, and construction of mass transit systems, airport operations, and policy development of federal transportation programs. Her career has taken her from the Gatún Locks in Panama to Chicago’s O’Hare International Airport, one of the nation’s busiest airports. 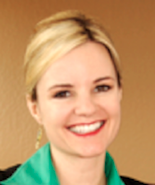 Since 2013, Fernandez has led VTA as General Manager and Chief Executive Office where she plans, organizes, directs, and administers all functions for the authority under policy direction from the 12-member VTA Board. 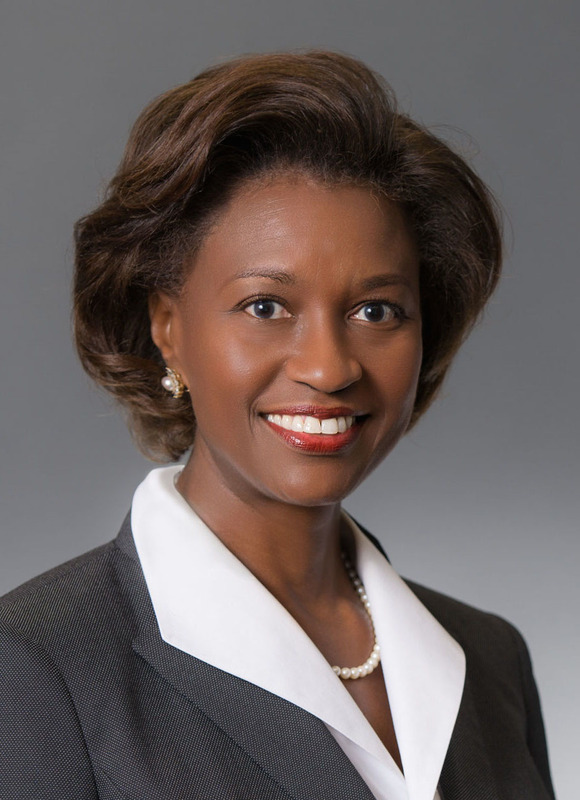 Prior to joining VTA, she was CEO for the New York Metropolitan Transportation Authority (MTA), where she was responsible for overall system security, development of capital and environmental sustainability programs, federal and state government affairs, and management oversight of the five operating agencies. She has been recognized broadly for her accomplishments. In 2013, she was recognized as one of the 50 most powerful women in New York by Crain’s New York Business, and the Silicon Valley Business Journal honored her as one of the 100 most influential women in Silicon Valley in 2015. Fernandez joined the MTI Board of Trustees in 2006 and currently serves as Chairperson. Outside of work, Fernandez takes full advantage of our great California weather, biking and walking along the many trails in San José. What to do with all those electric vehicle batteries? Lithium-ion battery pack for an electric vehicle. As more and more electric vehicles hit the road, the use of lithium-ion batteries has increased which has raised a critical question. What do consumers do with post-vehicle-application batteries? Research conducted by Drs. Standridge, Corneal, and Baine at Grand Valley State University, a partner in the Mineta National Transit Research Consortium, looks at this issue in depth focusing on three possible post-vehicle applications: (1) remanufacturing the battery for reuse in vehicles; (2) repurposing for non-vehicle use; and (3) recycling. A mathematical model developed by the authors considers these three possibilities in combination with estimates for new battery production. Results indicate that demand for new battery production could be reduced by 25% through the development of remanufacturing processes. Integration of remanufacturing and repurposing manufacturing capacities should occur to minimize the need for capacity development. 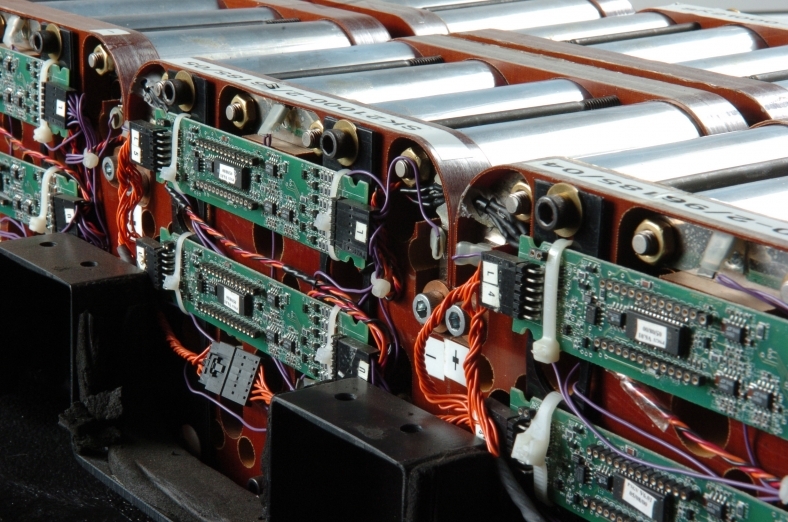 Recycling processes should focus on approaches that will work across battery chemistries and multiple battery supplies. Post-vehicle-application lithium-ion battery remanufacturing, repurposing, and recycling capacity development is needed. To learn more about the study, download the full report at transweb.sjsu.edu/project/1238.html. 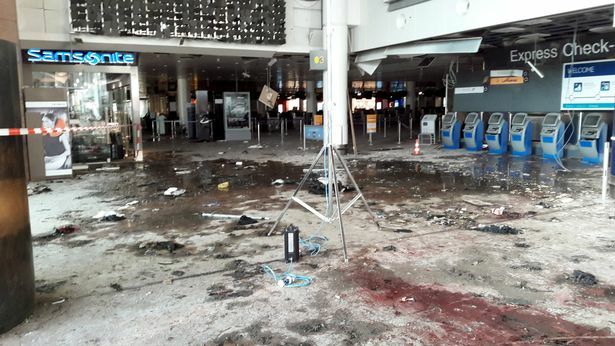 Aftermath of the terrorist attack at Brussels Airport. For two decades, MTI has monitored and analyzed terrorist attacks directed at surface public transportation, which are often part of broader terrorist campaigns. Recent attacks in Paris (November 13, 2015) and Belgium (March 22, 2016) underscore how soft targets – trains, concert halls, airports, and restaurants – are attractive targets for terrorists. Director of MTI’s National Transportation Safety and Security Center, Brian Michael Jenkins, and MTI Research Associate Dr. Jean-Francois Clair document French and American perspectives regarding recent terrorist attacks and examine the future trajectory of terrorism in Europe and beyond in their report, Trains, Concert Halls, Airports, and Restaurants—All Soft Targets: What the Terrorist Campaign in France and Belgium Tells Us about the Future of Jihadist Terrorism in Europe. Terrorist attacks in Europe attract far more media attention than attacks in other areas of the world, which tend be ignored for a variety of reasons. Reports of horrific attacks followed by news of more arrests and the discovery of further terrorist plots make Americans tune in. They also feed upon American anxieties, cause alarm, and lead to threat inflation. What do these most recent attacks in Europe tell us about the current and future terrorist threat? What do the most recent attacks say about the ability of European authorities to uncover and prevent further attacks? What implications does the terrorist activity in Europe have for the United States? A profound finding reveals that attacks on public transportation are in the terrorist playbooks and will remain favored terrorist targets. However, intelligence has proven critical in preventing attacks and, as such, increased cooperation among government agencies is essential. The 12th annual Mineta Summer Transportation Institute (MSTI) welcomed thirty-five students from San José’s East Side Union High School District for a three week, intensive, college-credit program that inspired students to think critically about their futures and their potential for careers in transportation. The competitively-selected students participated in a diverse, multimodal curriculum that focused on land and air transportation. A major highlight of MSTI were the eleven field trips students took to learn more about transportation and transportation careers, including trips to major technology firms, transit agencies, and transportation research centers. Students visited Google in Mountain View, CA, where they rode the Google Bus and Google Bikes, and learned about ride sharing and transportation initiatives at the company. They toured the Spartan Superway Garage to check out pod cars and elevated rail prototypes for personal, automated transportation. Students visited facilities at VTA and BART, where they could see, first-hand, how transit vehicles are maintained. United Airlines also hosted MSTI at their South San Francisco facilities where students learned about airline operations, internship opportunities, and participated in a Q&A session with United Airlines representatives. In the classroom, students heard from distinguished transportation leaders and faculty about issues related to sustainable transportation, mass transit, automated transportation networks, and the diverse range of career opportunities in the transportation industry. To learn more about MSTI and hear directly from students about their experience, check out this video. Mineta Summer Transportation Institute closing ceremony. California State Transportation Agency Secretary Brian P. Kelly at the National Transportation Finance Summit. The critical importance of maintaining and improving our transportation infrastructure was a theme echoed by many speakers at MTI’s 7th Annual National Transportation Finance Summit held June 17, 2016. 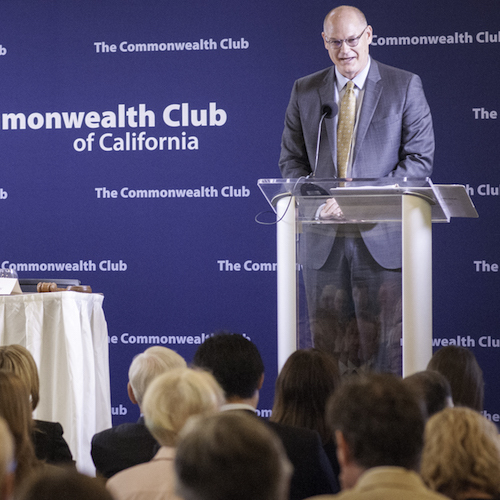 Brian Kelly, California State Transportation Agency Secretary, served as keynote speaker, while additional speakers and panelists included Norman Y. Mineta, Secretary (ret.) U.S. Department of Transportation, Dr. Asha W. Agrawal, Director, MTI’s National Transportation Finance Center, Grace Crunican, General Manager, Bay Area Rapid Transit District (BART), Steven Heminger, Executive Director, Metropolitan Transportation Division, Tim Rainey, Executive Director, California Workforce Development Board, and Dr. Karen Philbrick, Executive Director, MTI. At the event, results from year seven of MTI’s national public opinion poll on transportation taxes and fees were presented. This random-digit-dial telephone survey of 1,503 adults found that, of ten transportation tax options tested, six had majority support. In fact, more than half of American support a federal gas tax increase if the revenue is dedicated to improving maintenance, safety, or the environment. In addition, 82% said that expanding and improving transit services in their states should be a high or medium priority. The study’s authors, Drs. Asha W. Agrawal and Hilary Nixon, point to several key policy recommendations that stem from the survey’s findings. First, careful program design can increase support for higher gas taxes or a new mileage tax. In addition, emphasizing the environment, safety, and maintenance benefits can increase support for transportation taxes, including those for transit. Watch the full program or listen to the keynote address and/or panel discussion. Level boarding platforms improve access for persons with mobility impairments, and also benefit bicyclists, individuals with strollers, and others. Providing full access to a variety of transit modes for persons with disabilities allows for a greater degree of freedom, mobility, and independence, and greatly improves an individual’s quality of life. Since passage of the Americans with Disabilities Act (ADA) in 1990, transit agencies have made significant progress in improving accessibility, yet there are still opportunities to ensure mobility for all. 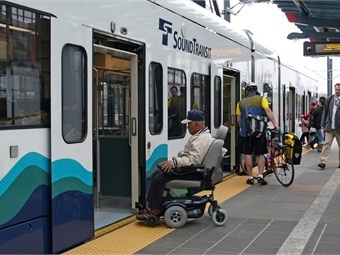 MTI’s recently published research report Improving Pathways to Transit for Persons with Disabilities examines the challenges persons with disabilities face with accessing transit and examines strategies transit agencies and their partners use to make improvements to provide fuller access. Understanding the needs of consumers with disabilities through direct outreach, evaluation of routes, and ongoing data collection efforts to monitor progress. Pursuing partnerships with advocacy groups, metropolitan planning organizations, and local governments to promote connectivity between land use and transit, and to allow cost sharing. Communicating plans to promote information sharing. Thinking holistically about projects so that they closely align services with customer needs. At the end of the day, improving pathways to transit for persons with disabilities, improves travel for all users – a seamless trip from origin to destination is the true measure of success.